There's a good chance that wherever you're reading this from, you're enjoying the cooler weather, you're loving the colorful leaves on the ground, and you're pulling out all of your sweaters out of storage. Or maybe you live in California like I do, and you're coming to terms with the fact that, once again, "fall" doesn't really exist here. After spending the past four years living in the Midwest, I had finally come to know and love autumn, so I'm a little sad that I don't really get the season (or any seasons) now that I'm back in Orange County. It's pretty much sleeveless tops and 80 degrees until around the time when "winter" should be here, and only then will I be able to put on a couple of layers and "warm up" with a hot chocolate. Of course, I'm not blind to the fact that I'm lucky to live here. I keep reminded myself that I don't have to suffer through months of avoiding slipping on ice this December through April, but I can't help but be a little sad. I'm still struggling with missing out on friends hanging out and working at the newspaper back in Illinois, so missing out on the changing seasons (especially missing out on doing things like going to an apple orchard with my brother and his kids) is taking some getting used to. On the bright side, I still get to do things like walk around Venice Beach yesterday, hang out at an awesome outdoor brewery with my best friends on Monday night, and wear sandals and this sleeveless gingham top. I really love this top and this skirt, so I was kind of surprised when I realized I had never put them together before yesterday. See? There are still plenty of "summer" looks to put together. I'm hoping to finally have another pop culture post up by the end of the week, so please pressure me into doing so so that I have the motivation to actually sit down and write it. It's going to happen. Girl this outfit is too cute! You look great in it. Sweet and perfectly Elana as always. We're missing you back here too! I think I love this top every time you wear it, and paired with khaki, it's pretty much dreamy. Though we do have a lovely Fall in Nashville, it's still on the way! So I'm not totally wearing sweaters yet. Oh, this is such a classic, lovely outfit. So utterly timeless and always chic. I guess the grass is always greener, huh? I wish I had such problems with the weather! What a gorgeous outfit! The skirt is perfect - I am so envious - I absolutely need a skirt like this in my wardrobe! Here I am, pressuring you. So while everyone is pumped for the switch to fall, and it's slowly infecting me as well, I can't help but feel remorseful in saying goodbye to summer. Enjoy that warm weather for me then! This definitely is a summery outfit. 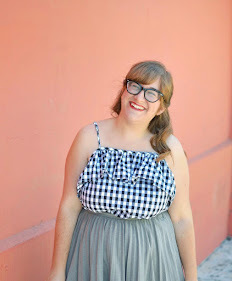 I love the gingham top. I think its funny cause living in the Midwest now but growing up in the the Northeast I still feel like Chicago gets gypped a bit on fall. One day its 80 the next its 50 and raining with no nice cool weather and leaves changing in sight.